A logogram, or logograph, is a written or pictorial symbol that is used to represent an entire word, unlike phonograms, which represent phonetic sounds. Logograms are commonly known as “ideograms” or “hieroglyphs” although, technically, an ideogram represents an idea rather than a specific word. As a purely logographic script would be impractical for most languages, writing systems that incorporate logograms also make use of phonetic elements. Thus, such writing systems make use of a combination of phonetic and logographic symbols, including ideograms. A significant advantage of using logographic symbols is that they can be easily understood no matter what language is spoken, which is not the case with writing systems like alphabets or syllabaries which are purely phonetic. Thus, the use of logograms allows people of different cultures to communicate even when their spoken languages are mutually unintelligible. On the other hand, the number and complexity of logograms seriously reduces their utility as a common language for all people. It takes many years of education to master a large enough set to support the communication of detailed and complicated ideas and concepts, and thus the less educated find themselves functionally illiterate. Thus, while logograms have many benefits, and certainly were a great advance for humankind in supporting written language, the development of the more functional phonetic alphabets allowed all people to be able to express themselves in written form with greater ease. Logographic systems, or logographies, include the earliest true writing systems. The first historical civilizations of the Near East, China, and Central America used some form of logographic writing. Cuneiform writing was developed by the Sumerian people of Mesopotamia around 3300 B.C.E., and had a strong influence on the development of a number of other writing systems, including the Akkadian and Babylonian scripts. Cuneiform evolved from the use of clay tokens to count agricultural and manufactured goods. Multiple clay tokens were sealed into jars, and a stylus was used to imprint an image of each clay token contained inside. Eventually, symbols were developed for representing multiple numbers, and the symbols began to replace the clay tokens altogether. Early Sumerian writing included pictographic images. The image for “bird” was clearly a bird, for example. After 3000 B.C.E., however, these images began to evolve into the familiar groupings of wedge shapes that are recognized as cuneiform writing. Around this time, the writing system also began to change into a more phonetic-based system. The image below shows the development of the sign SAG "head." Stage 1 shows the pictogram as it was drawn around 3000 B.C.E. Stage 2 shows the rotated pictogram as written around 2800 B.C.E. Stage 3 shows the abstracted glyph in archaic monumental inscriptions, from ca. 2600 B.C.E., and stage 4 is the sign as written in clay, contemporary to stage 3. Stage 5 represents the late third millennium, and stage 6 represents Old Assyrian of the early second millennium, as adopted into Hittite. Stage 7 is the simplified sign as written by Assyrian scribes in the early first millennium, and until the script's extinction. Egyptian hieroglyphs, many of which function as logograms. 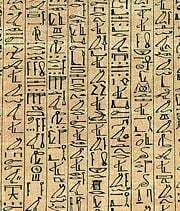 Ancient Egyptian hieroglyphs were used from about 3200 B.C.E. until almost 400 C.E. Egyptian hieroglyphs are often clearly recognizable as the objects they represent; pictographic representations of humans, animals, and tools require little guesswork as to the word they represent. While hieroglyphic writing is generally done phonetically, nearly all the phonetic glyphs can also serve as logograms. A silent vertical stroke accompanying a glyph indicates that it should be read as a logogram. Many of the phonetic values of Egyptian glyphs are also influenced by the meaning of the glyph when used as a logogram. In English, this would be similar to an image of a book being assigned the phonetic value “B,” because “B” is associated with “b”ook. Thus, for example, with the vertical stroke the logogram dšr, means "flamingo:"
While Egyptian hieroglyphs may be the most well-known, a number of other hieroglyphic scripts employ the use of logograms. These include Anatolian hieroglyphs (used to write Luwian), Mayan hieroglyphs, Olmec hieroglyphs, Mi’kmaq hieroglyphs, and Dongba script. With the exception of the Dongba script, which is still used by the Naxi priests in China and Tibet, hieroglyphic writing systems are no longer in use. A number of Asian languages (most notably Chinese, Japanese, and Korean) employ heavy use of logographic characters. Chinese and its derivative, Japanese kanji, are perhaps the most widely cited examples of predominantly logographic scripts still in use today. When discussing Asian languages, the term “character” often replaces the term “logogram.” In the Chinese language, there are over 50,000 characters, 2,000 of which are considered necessary for basic literacy. In Japanese, knowledge of 1850 characters is required. While not all of these characters are technically logograms, most have logographic elements. For example, a character may represent only a part of a word as well as the word itself. Chinese characters are traditionally divided into six types, of which only a very small number are true logograms, representing a single word. Some of the oldest Chinese characters are stylized pictographs, like 人 for "man," 木 for "tree," or 山 for "mountain." There are also a number of ideographs (representing abstract ideas), such as 上 for "up" and 下 for "down." Many characters are "compounds," combinations of elements (called radicals) in which each radical hints at the meaning. For example, 休 for "rest" is composed of the characters for "man" (人) and "tree" (木), with the intended idea of someone leaning against a tree, thus resting. The majority of Chinese characters, however, are compound characters called “semantic-phonetic compounds.” These characters, which represent approximately ninety percent of existing characters, are made up of a radical that hints at the meaning of a character, as well as a phonetic component that helps clarify the pronunciation of the character. Within the context of the Chinese language, Chinese characters by and large represent words and morphemes rather than pure ideas; however, the adoption of Chinese characters by the Japanese and Korean languages (where they are known as kanji and hanja, respectively) have resulted in some complications to this picture. Many Chinese words, composed of Chinese morphemes, were borrowed into Japanese and Korean together with their character representations; in this case, the morphemes and characters were borrowed together. In other cases, however, characters were borrowed to represent native Japanese and Korean morphemes, on the basis of meaning alone. As a result, a single character can represent multiple morphemes of similar meaning but different origins (and thus different pronunciations) across several languages. Because of this, kanji and hanja are often described as morphographic writing systems. All logographic scripts, both ancient and modern, include a phonetic system that works in tandem with logographic elements of the script. In some cases, like Egyptian hieroglyphs, most glyphs are used for their phonetic values and not their logographic meaning. Many logographic systems also employ an ideographic component (“determinatives” in Egyptian hieroglyphs or “radicals” in Chinese) that serves to clarify the meaning of a particular logogram. Scripts can also use phonetic complements to give clues as to the intended interpretation of a logogram. One of the clearest advantages to the use of logographic symbols or characters is their universality. This can be seen in mathematics, where mathematical formulas and problems can be easily understood by mathematicians from any country. This advantage is also evident in China, where hundreds of spoken dialects make use of the same (or similar) written language. Chinese who speak different dialects may not understand each other through speech, but can communicate effectively through writing. Even Japanese and Korean people, familiar with a smaller set of Chinese characters, can achieve better communication among their different cultures through the use of these logograms. Logographic writing systems have clear disadvantages as well, one of the most obvious being that they are more time consuming to learn. Instead of the small number of letters that constitute a phonetic alphabet, logographic writing systems require the memorization of a large group of logograms. Also, while most logographic languages have phonetic components, the pronunciation of a word is generally dependent on the reader knowing the meaning of a particular logographic symbol. Words in many alphabetic writing systems such as Italian can be sounded out if they are not known to the reader; this cannot be done in more logographic languages like Chinese or Japanese. Logographic characters can also create difficulty with electronic devices. Instead of the reasonably small set of characters that make up most alphabetic systems of writing, logographic scripts like Chinese are much more cumbersome to type. 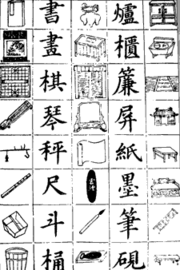 With advances in technology, various methods have been developed for typing logograms: Chinese can be typed on a computer either by breaking a character up into its constituent parts, or by entering a phonetic pronunciation and selecting the correct character from a list. ↑ Lawrence Lo, “Sumerian,” Ancientscripts.com (2007). Retrieved February 23, 2009. ↑ Rykle Borger, 184 sag, Mesopotamisches Zeichenlexikon, Initiative for Cuneiform Encoding. Retrieved February 23, 2009. ↑ Samuel Noah Kramer, Thirty Nine Firsts In Recorded History (University of Pennsylvania, 1998, ISBN 0812212762). ↑ Simon Ager, “Types of Chinese Characters,” Omniglot (2009). Retrieved February 23, 2009. DeFrancis, John. The Chinese Language: Fact and Fantasy. University of Hawaii Press, 1984. ISBN 0824810686. Hannas, William C. Asia's Orthographic Dilemma. |University of Hawaii Press, 1997. ISBN 082481892X. Hoffman, Joel M. In the Beginning: A Short History of the Hebrew Language. NYU Press, 2004. ISBN 0814736904. Kramer, Samuel Noah. Thirty Nine Firsts In Recorded History. University of Pennsylvania, 1998. ISBN 0812212762. This page was last modified on 24 February 2009, at 15:34.